Enter the Epic Movie and Ecos Pods Giveaway! Are you as excited to see the movie Epic as my family is? The film is something my kids won't stop talking about, and I'm excited to share an awesome promotion AND a giveaway opportunity for our readers! EPIC has it all – Samurai-like action and warriors, incredible aerial battles, laugh out loud humor and an adventure that will transport you to a hidden, rich and beautiful world, unlike any you’ve seen before. The 3D CG adventure comedy is now in theaters everywhere! From the creators of ICE AGE and RIO, EPIC tells the story of an ongoing battle between the forces of good, who keep the natural world alive, and the forces of evil, who wish to destroy it. When a teenage girl finds herself magically transported into this secret universe, she teams up with an elite band of warriors and a crew of comical, larger-than-life figures, to save their world…and ours. EPIC features an incredible cast including: BEYONCÉ KNOWLES, COLIN FARRELL AMANDA SEYFRIED, AZIZ ANSARI, PITBULL, STEVEN TYLER, JOSH HUTCHERSON, CHRIS O’DOWD, CHRISTOPH WALTZ and JASON SUDEIKIS. Epic is partnering with Ecos Pods, a free & clear edition that reduces mess, measuring and surprisingly, cost-per-load, while cleaning laundry beautifully and safely. 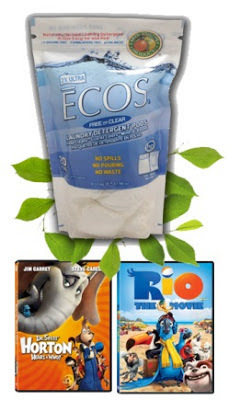 Ecos Laundry Detergent is currently the top-selling natural laundry detergent world-wide. It's available coast to coast, in stores ranging from Whole Foods to Wal Mart to Costco and just about everywhere in between. Ecos is created in centers running on 100% green energy, and Earth Friendly Products, the company that makes ECOS, has literally walls of awards, partnerships and certifications: California's GEELA Award, EPA's Design for the Environment, USDA Biopreferred, Healthy Child Healthy World, the Silent Spring Institute and, well, the list just goes on! Because Ecos products are natural and plant-based, they're like leaf men - defenders of the forest and mother nature in the new movie! Play the Ecos Epic game & win prizes! It's a matching game, and once all the Epic characters and Ecos products are matched, players can enter into a sweepstakes for chances to win movie tickets & product. In addition to this fun promotion, we are also having our own giveaway here on the blog! To be entered to win, just comment on this post with whether you plan on seeing the movie, and why you want to win this prize! You have until June 10th at 11:59 pm CST to get your entries in. We'll randomly pick one winner to get the prize. Open to U.S. residents ages 18+ only, one entry per person. Full promotional rules here. *Prize packs provided by Ecos and 20th Century Fox. Similar prize pack received to share and host this giveaway. Opinions expressed are 100% my own.